One of the most requested recipes on this blog is this Marathi special, very fragrant dry masala. I was waiting for a trip to India to get this recipe from my pachi (aayi’s sister) who is my very important connection to anything Marathi :). I still remember those days in Belgaum. I was in college hostel while doing my bachelors. The food in the canteen was so bad that after a while we could not take it any more. My roommate and I had always eaten homemade Konkani food and this hostel food was a big shock to us. She knew little bit of cooking which was mainly Konkani – with ground coconut masalas. We were not allowed to go and meet our relatives every week (otherwise I would have probably visited pachi every weekend). So we were in for a big trouble. One day, I went to pachi’s house and asked her for some simple recipes that I could cook in the hostel on a typical small one burner electric stove and without the help of any other electrical appliances like mixer, blender. Keeping in mind I didn’t even know to make simple rice, she gave me few suggestions. She gave me some kala masala and gave some simple ideas of using this masala. Also some other masalas which I have forgotten now. But I still remember the heavenly aroma of this kala masala. So this time, when we had been to India, I asked pachi for the recipe. She said she buys the ready made powder and also, every one has their own versions which have different aromas. She promised to ask around in her family and give me the recipe for the one she likes the most. After few days, she suggested a recipe from the famous book Ruchira by Kamalabayi Ogle. When I tried this, I made very few modifications to it and reduced all the ingredients proportionately to make this powder in a quantity that we can finish when it is still fresh. Verdict – I clearly remember this fragrance. A tea spn of this masala in any dish, brightens the whole dish. I have been using this a lot these days. I am living my college days again. One of the first dishes I tried with this is, my favorite Kale vatanechi amti . Remember – If you are making any dry masala, make it in small quantity and finish as soon as possible (like in 1-2 months). As time passes, the fragrance goes away bit by bit. Heat very little oil and fry all the ingredients under ‘fry in oil’. Take care not to burn anything. You can fry them one by one. Take them out. Dry roast the ingredients under ‘dry roast’. Grind all of them together to a smooth powder. Add remaining ingredients and mix well. Store in air tight container. (I divided it into two equal parts. One I kept in freezer. It will be used after the first batch gets over). PS: For those who have never seen dagad phool, here is a picture. It is not same as star anise. This looks like dried flowers or lichens that are often seen on trees. It has a very strong smell. I think the main characteristic aroma of kala masala comes from this ingredient. Aayi uses this in her chicken curry, so for me, this spice has typical chicken curry smell :). I have many powder recipes posted by u , just want to ask can u get good powder like fine if u grind it in the blender u get here (not the indian mixer). if anyone has any experience please let me know because i really want to make samabar powder so i will bw waiting. Shilpa: You can use coffee grinder for grinding masalas. sorry abt the spelling mistakes in the above mentioned comment. Shilpa: I checked the pack, it does not have any English name :(. Some people call it stone flower or rock flower. Rashmi, if you are still in UAE, you will get dagad phool in Al Adil. Purchased it last week. Shilpa: No, they are not the same. Please check the update in my post. Hey Shilpa, where did you get the kale vatane from? The picture of the aamti looks tempting. And i completely agree, the warm aroma of goda masala is so comforting. Shilpa: Indian store. Do you want some? I notice you are having similar questions asked about dagad phool that a few others have also had…”stone/rock flowers” is the only English I have ever heard for it. It is an aromatic lichen that grows only in very few places of the world, and, as far as I know, only appears in Marathi dishes. Manisha might know more…but I do know that it is hard to find here in the states; I seem to remember that there was just ONE online Indian grocer that stocked it (can’t recall which one though). Shilpa: Ohh in those days, I used to think, I would never be able to cook :D. I was terrified of stove ;). We have a very good Indian store here in Kansas and we get the dagad phool there (in huge packet which is enough for my next generation also). Hi…ur kale vatanyachi amti looks mouthwatering….just 1 question, do you use white sesame seeds or black? Hi! nice tempting post ! I saw some readers ask about dagadful! yes it is same as Star anise(English name) ! I too live in Gulf and was confused totally with spices names when first arrived here armed with all my mooms cooking recipes and spices instructions about 7 years back . Rashmi… u can try Mazdi brand Star anise..(English name and arabic also will be mentioned on the packets.) Its good . Some other brands like Priya /MDH also do sell star anise powders but its better when bought in whole .Its use is miminum in arabic cooking normally we dont find these in big supermarkets.So i normally buy these in indian stores . Shilpa: Shubhangi, star anise and dagad phool are not same. They look different and have very different aroma. Please check my update in the post. I beg to differ with Shubhangi. Dagad phool and Star anise are not the same. To the best of my knowledge Dagad phool is not available in N. America/Canada it is only available in India and particularly Maharashtra. It stays good for quite some time. wow! thank you shilpa & shubhangi for helping me out..
vyjayanthi: im gonna check the Al Adil outlet in dubai/sharjah, might get lucky!! !you can give a try there.. Thanks for posting such a wonderful Masala Shilpa. It is my favorite too. Used it any dishes makes it so aromatic. Last time i got it from the Indian store. I am going to try this one ASAP after i get dagad phool. As you said the big packet might last me till my daughter in law comes home after a few years. I love kalya vatanyachi aamti too. I got abt 2 kgs of the same from Mumbai as here it is not avble in the Indian Stores here. Waiting for your recipe of the same. Store it in the freezer, Shilpa. It will last longer. Some idiot wrote that dagadphool is the same as star anise and now everyone thinks they are the same. Star anise is the fruit of an evergreen tree. 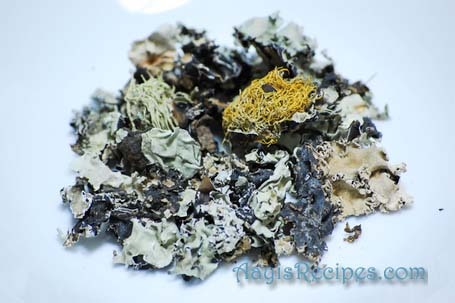 Dagadphool is a lichen. Not the same. There are reports that this lichen is found in the US but I am not knowledgeable enough to tell the difference between dagadphool and these lichens. Pics of ‘shaiba leaves’ look very much like dagadphool except that the dagadphool I have seen has been more grey than brown. Musy, you can get kale vatane in some Indian stores. My friend lugged them for me from Texas. I haven’t seen them in Chicagoland or around here. Shilpa: I was waiting for your comment Manisha. Thanks. Yes, I stored half of it in freezer. About star anise and dagad phool, I don’t know why people have created such a misunderstanding everywhere on the internet. I just searched for dagad phool and got the links for star anise. Since aayi used this frequently in chicken gravy, I knew how it looked like. Otherwise would have definitely got confused. if you have a bit of dagad phool, could you show it to a local botany department to get the definitive answer? it will put all of us out of our misery. is goda the same as kala masala? I am regular visitor to you blog and really like reading your recipes. My husband is telugu and my MIL has a sambar recipe in which she uses Dhagad Phool. Can you please tell me whether you know where to get them in US? I have looked everywhere but no luck. You can email me at my email address. Thanks and keep up the good work. Shilpa: I found it in Indian store. Not sure if it is available anywhere else. Shilpa: Thanks for the name Jaya mayi. i am a frequent visitor of ur website. it is excellent. what is meant by dagadphool ? i saw the picture of it. but i couldn’t understand. do u know the translation of dagad phool in gujarati, malayalam or any other indian language? do we get in the grocery store? Shilpa: Seetha, I do not know its name in any other language. It is usually available in Indian stores. Shilpa: Ambica – 89th and Metcalf (next to walmart neighborhood). have ready made goda masala powder with them..
are u related to Ms. Jaya v shenoy ? Shilpa: No, I am not related to Mrs Jaya Shenoy. Thanks for Kala Masala. Kindly let me know in which other dishes we can use this masala apart from the one you have mentioned. Also, please tell in which other masala powder, we can use Dagad phool. Can it added to Sambar powder or Palya masala etc. Shilpa: Please search goda masala in the searchbox on the top of the site. There are many dishes you can use it. You can’t use dagad phool in sambar powder as it has a very strong aroma. I use it in chicken curries. I live in Canada and where I live I dont think i can find dagad phool.. Can I replace that with something else? Shilpa: Suma, I haven’t seen any other spice which can substitute for dagad phool, it has a very different and unique aroma. what is dagad phool in konkani..
shilpa: I don’t think it has a Konkani name, I haven’t seen its usage in any Konkani dishes. I live in goa and went looking for dagadphool and was only shown star anise. I was told the konkani name is ‘xello’ as in ‘amballo’. Shilpa your recipes are always spot-on. Your website is my go-to page for authentic kokani dishes!!! Keep it up!!! thanks a lot for the recipe and about the reality of the Dagar phool… aaj tak i’ve been made a phool about this phool. i think as star anise is translated as phool chakri , the two have got mixed up somewhere. Shilpa: As far as I know, both are not same. Marathi moggu looks like clove. Hi Shilpa….I so know that aroma of goda masala.. There was this girl in my office who used to bring egg curry made with this masala………we used to sit in different depts and beileve it or not the day she had this in her lunchbox and she opened the whole office would be awash with the aroma………….yes we still have offices where there arent any separate canteen areas so some lunchtime there is a burst of aromas………. I brought very little quantity of dagadphool and kaale vatane on my last trip to Inida, which I will soon run out of. Do you think this store in Kansas – Ambica, will ship it to Canada ? I can see there is sm confusion regarding dagadphool.. ..after seeing the pic I knw tht in central india this spice is also known as CHABEELA. hope dis will help to clear sm confusion. I wanted to know your cup measurement, every time I try one of your recipes I just assume some average Indian tea-cup size for it, but it will be nice if you could give me some sort of a reference (e.g how many milliliters). Here in Australia, I use those different measurements you get in the shops for 1 cup , 1/2 cup, 1/3rd cup etc. and I feel that cup will be too big for your recipes. I live in Melbourne Australia. Can someone help me find Dagad Phool/Lichen in here? I just wanted to know if there is any substitute for this Dagad phool. I cant find it in toronto. No, you can just leave it out. Aroma will be a little different, but that should be ok.
Dagad phool is called as Kallu hoovu in Kannada. It is available in any shop which sells native herbs (Grandhige Angadi). In Bangalore you can get it in the shops around Gandhi bazaar Circle of Basavanagudi area. Some people use this in preparing Mysore Sambar. It gives a specail aroma for Sambar. I have a question – the very 1st ingredient you say is 1 cup coriander seeds? Is that right? 1cup? Sounds like a lot compared to 1/8, 1/4 etc cups or a few gms or teaspoons of other ingredients. Just want to confirm this is not a typo. Great recipes on this site. Searched for dagaphool for the longest time here in Georgia, USA and finally found it in an Indian Store in Atlanta called Patel Brothers (google it). They have many packets of those. You can call and check if they deliver by post…! Keep up the good work Shilpa. Thanks..
Dagad phool is also known as mountain moss.Star anise is diffrent it resembles a 5 petaled wooden flower with small seeds in it.In Bangalore Dagad phool available at Star Bazar chain of hypermarkets. Thank u so very much Shilpa for this recipe. i am a big foodie and i loved the konkani cuisine on a recent trip to Goa. I am definitely going to try out this masala ASAP. Dagad phool in many indian languages is also called shailaj. i live in ooty and it is plentily available here. this spice is also used in many a east indian recipes…mainly non vegetarian ones. In western parts of orissa they mainly use it in lamb curry. thank you again. i bought shahjeera but the packet said kala jeera…when i asked the shopkeeper he said both are same… does shahjeera have a stinky smell?? 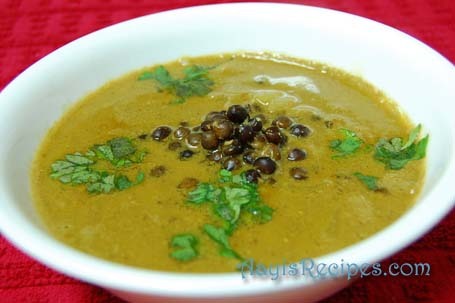 Nice to know of this recipe of Kaala Masala. 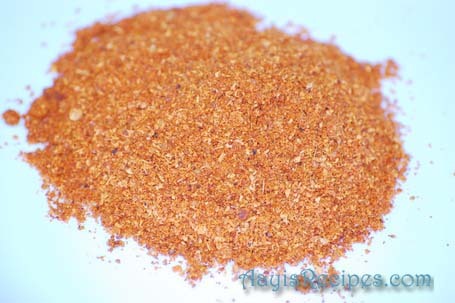 Interestingly, the Kaala Masala used in traditional brahmin households of Maharashtra do not use strong spices, such as cinnamon or cloves in their Kaala Masala. The reason being, this version makes the masala, very saatvic (https://secure.wikimedia.org/wikipedia/en/wiki/Sattvic_diet). Not eating meat and keeping garlic/onion to a minimum and using Kaala Masala with the above change has been the regimen for hundreds, if not thousands of years towards increasing the saatvic quality of the being. Unfortunately, very few people know this ! Garam Masala has a reason for it being named so, because it increases the raajasic quality (restlessness). It has an amazing flavor, no doubt, but consistent use has its effect. Quality of food affects the mind in a large degree! Well! the dagad phool confusion has been sorted out for me! After reading all the comments. The recipe from a konkan cookbook als has green cardamoms, peppercorns, bay leaves, mace and nagkesar!! Also no special instructions for frying in oil and dry roast.I wonder if the above ingredients are not necessary as they are there in all the garam masalas. Soma. Hi shilpa can you please tell me how many grams is 1 cup of coriander seeds….? We are using the Tejpatta and cardmon/ Elaichi both masala and normal ilaichi which is using in sweets. Also we are using the Groudnnuts. But not using the methi. I made the masala over last weekend and tried it yesterday for an upkari i made for sankashti. It was awesome and just like the one I used to ask my colleague to get me from belgaum. I live in bangalore and got the dagad phool in gandhi bazaar… it is called kalllu hoovu in the gandhige shops around the place. cost some 40Rs. for 10 gms or so i guess. Hi Shilpa, thanks for the masala recipe.. My mil’s secret ingredient has to be ‘kala tikhat’ .. She’s maharashtrian and a wonderful cook.. Also, Dagad phool is also known as Kalpasi in tamil and its scientific name is Parmotrema perlatum. It’s a lichen as someone above mentioned. Cheers and keep the recipes coming. I tried this recipe (goda masala) and found it very good. one of my friend from pune, had this masala in her house. When asked her she said it was her mom’s secret recipe. She also said that they fry onions, tomatoes and dry them in sun. Rest she didnt say!!!!!! So my question is do we add fried onion and tomatoes to the mix. Pls do let me knw. Never heard of those in goda masala. Hi Shilpa. You have a very nice blog. In the Kala/Goda masala recipe you probably missed Bay leaf ( Tamal patra).